For more information call 936-295-7641. Fore more information call 936-295-7641. - Attend the SALT Training Week : Sunday, 6/10 through Friday, 6/15. For more information & sample schedule check out the Woodsman Camps info. For more information & sample schedule check out the Ranger Challenge Camps info. The best week of summer for kids! Since launching our first day camp in 1989, Forest Glen has provided one of the highest quality day camps each summer to campers from Huntsville, TX & The Woodlands, TX. Kids entering Kindergarten-7th grade will hop on our buses each day & have a blast at camp with our incredible team of counselors. Don't miss out on the BEST week of summer for kids at Forest Glen Day Camps! Campers are grouped together by grade level. You can request campers to be together, but their age must be within one year of each other. Sibling requests are discouraged when one child is more than a year older than the other. Join us for a meaningful weekend for Mothers & Daughters at Forest Glen Camps. Mother Daughter Weekend is an opportunity for moms & girls to get away together and enjoy all the fun & excitement of camp. Have a blast at any of our awesome activities and make memories together at our beautiful camp. In addition to all the Mother/Daughter specific activities, hear a captivating & challenging talk feat. Kristen Welch (author & blogger of wearethatfamily.com). This is a weekend you don't want to miss! Mother Daughter Weekend is JUST FOR LADIES! Daughters should be in Kindergarten-12th grade (2016-2017 School Year), but College & Up are welcome to attend! What's this gonna cost me? Come EXPERIENCE Forest Glen Camps together as Mothers & Daughters! • Canoes, Paddleboards, Archery, Archery Tag, Fishing (bring your own poles! ), Ziplines, Gaga Ball, Rock Climbing, Sand Volleyball, Basketball, Rope Courses & much more! • Check out our brand new activities: ARCHERY TAG (think of paintball... with bows & arrows... arrows with foam tips) & STAND-UP PADDLEBOARDING! • Worship & songs led by singer/songwriter duo THE RELIQUES! • Our friendly, energetic staff will faciliate a ton of fun activities & games that will bring a smile to your face & help you bond together as Mothers & Daughters! • We'll worship Jesus TOGETHER led by an incredible band! This is a 3-day 2-night event, beginning at 5:30PM on Friday, Oct. 14 and ending at 11:30AM on Sunday, Oct. 16. Moms will stay with their daughters in air-conditioned lodges with full showers & bathrooms. Each lodge contains 8 suites w/ 2 rooms per suite joined by a shared bathroom & shower in between. Each room has 4 bunk beds. To maximize our attendance for this event, it is highly likely that you & your daughters will be in a room with other mothers/daughters. In the case of 1 mother & multiple daughters, we will do our very best to keep you all together. Join us for a meaningful weekend for Fathers & Sons at Forest Glen Camps. Father Son Weekend is an opportunity for dads & dudes to get away together and enjoy all the fun & excitement of camp. Hear from special guest speaker Jeff Springer (2012 Texas Principal of the Year & Principal of Magnolia High School), compete in tons of father/son challenges, participate in our many camp activities, and enjoy quality “man-time” together. Make memories at this awesome weekend just for dudes! Father Son Weekend is JUST FOR DUDES! Sons should be Kindergarten-12th grade (2016-2017 School Year), but College & Up are welcome to attend! 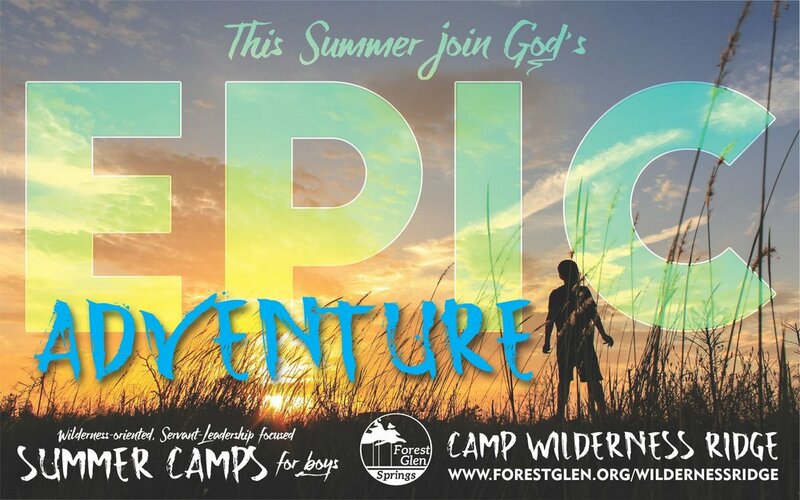 Come EXPERIENCE Forest Glen Camps together as Fathers & Sons! • Canoes, Blobs, Archery, Swimming Pools, Fishing (bring your own poles! ), Ziplines, Gaga Ball, Rock Climbing, Sand Volleyball, Basketball, Rope Courses & much more! • Hear from special guest speaker Jeff Springer (2012 Texas Principal of the Year & Principal of Magnolia High School). • Our friendly, energetic staff will faciliate a ton of fun activities & games that will bring a smile to your face & help you bond together as Fathers & Sons! • COMPETITIONS!!! Fishing competitions, sports competitions, shooting competitions, and much more! This is a 3-day 2-night event, beginning at 5:30PM on Friday, Sep. 30 and ending at 11:30AM on Sunday, Oct. 2. Dads will stay with their sons in air-conditioned lodges with full showers & bathrooms. Each lodge contains 8 suites w/ 2 rooms per suite joined by a shared bathroom & shower in between. Each room has 4 bunk beds. To maximize our attendance for this event, it is highly likely that you & your sons will be in a room with other fathers/sons. In the case of 1 father & multiple sons, we will do our very best to keep you all together.